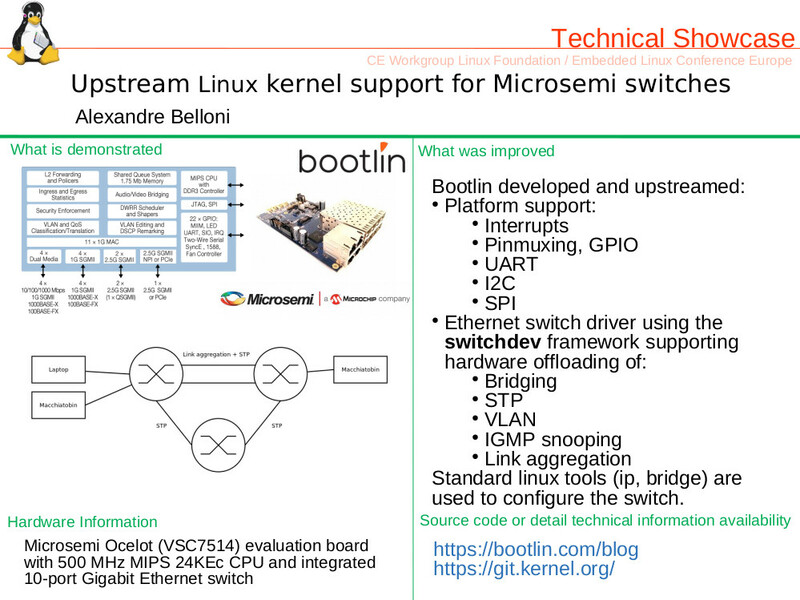 After publishing our slides and videos from the Embedded Linux Conference Europe (ELCE), reporting on talks selected by Bootlin engineers, and mentioning the award given to Michael Opdenacker, here comes the last blog post giving feedback from our participation to the 2017 edition of this conference. On Thursday after ELCE, Bootlin engineers Maxime Ripard and Thomas Petazzoni participated to the Device Tree workshop, a day-long meeting to discuss the status and future of Device Tree support, especially in the context of the Linux kernel. Maxime Ripard brought up the topic of handling foreign DT bindings (see slides). Currently, the Device Tree bindings documentation is stored in the Linux kernel source tree, in Documentation/devicetree/bindings/. However, in theory, bindings are not operating-system specific, and indeed the same bindings are used in other projects: U-Boot, Barebox, FreeBSD, Zephyr, and probably more. Maxime raised the question of what these projects should do when they create new bindings or extend existing ones? Should they contribute a patch to Linux? Should we have a separate repository for DT bindings? A bit of discussion followed, but without getting to a real conclusion. 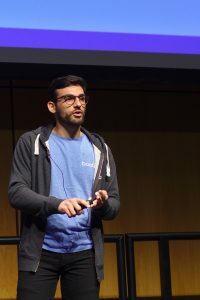 Thomas Petazzoni presented on the topic of avoiding duplication in Device Tree representations (see slides). Recent Marvell Armada processors have a hardware layout where a block containing multiple IPs is duplicated several times in the SoC. In the currently available Armada 8040 there are two copies of the CP110 hardware block, and the Linux kernel carries a separate description for each. While very similar, those descriptions have subtle differences that make it non-trivial to de-duplicate. However, future SoCs will not have just 2 copies of the same hardware block, 4 copies or potentially more. In such a situation, duplicating the Device Tree description is no longer reasonable. 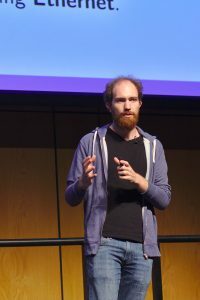 Thomas presented a solution based on the C pre-processor, and commented on other options, such as a script to generate DTs, or improvements in the DT compiler itself. A discussion around those options followed, and while tooling improvements were considered as being the long-term solution, in the short term the solution based on the C pre-processor was acceptable upstream. 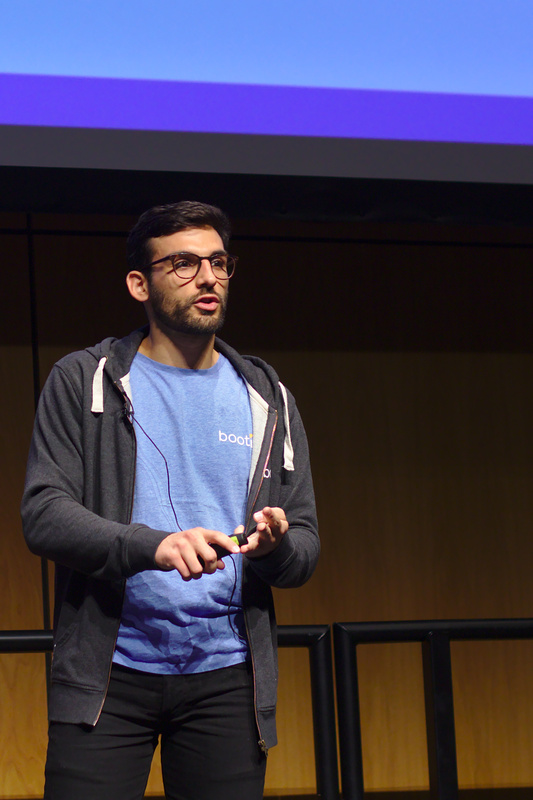 For Bootlin, participating to such events is very important, as it allows to expose to kernel developers the issue we are facing in some of our projects, and to get direct feedback from the developers on how to move forward on those topics. We definitely intend to continue participating in similar events in the future, for topics of interest to Bootlin. 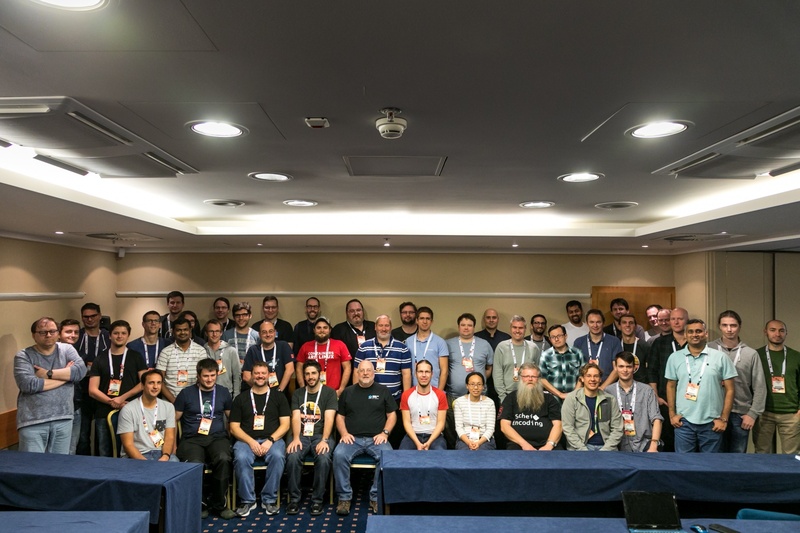 The Embedded Linux Conference Europe 2017 took place at the end of October in Prague. 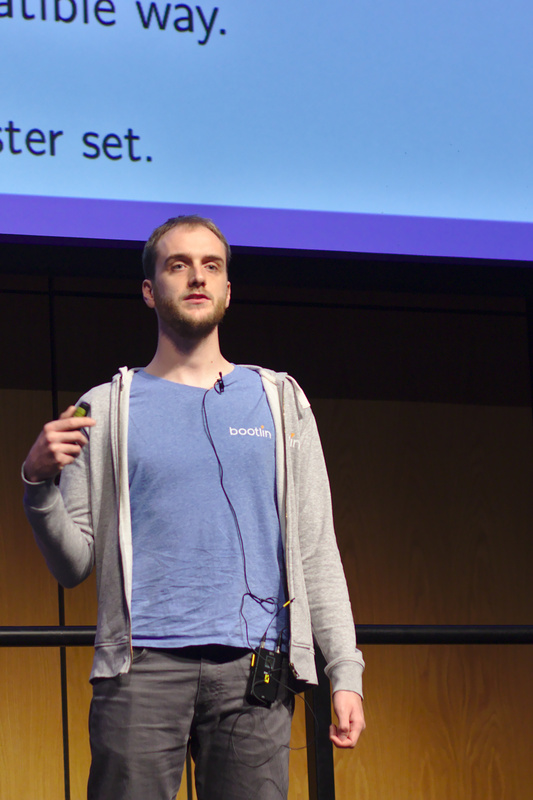 We already posted about this event by sharing the slides and videos of Bootlin talks and later by sharing our selection of talks given by other speakers. During the closing session of this conference, Bootlin CEO Michael Opdenacker has received from the hands of Tim Bird, on behalf of the ELCE committee, an award for its continuous participation to the Embedded Linux Conference Europe. Indeed, Michael has participated to all 11 editions of ELCE, with no interruption. He has been very active in promoting the event, especially through the video recording effort that Bootlin did in the early years of the conference, as well as through the numerous talks given by Bootlin. Bootlin is proud to see its continuous commitment to knowledge sharing and community participation be recognized by this award! 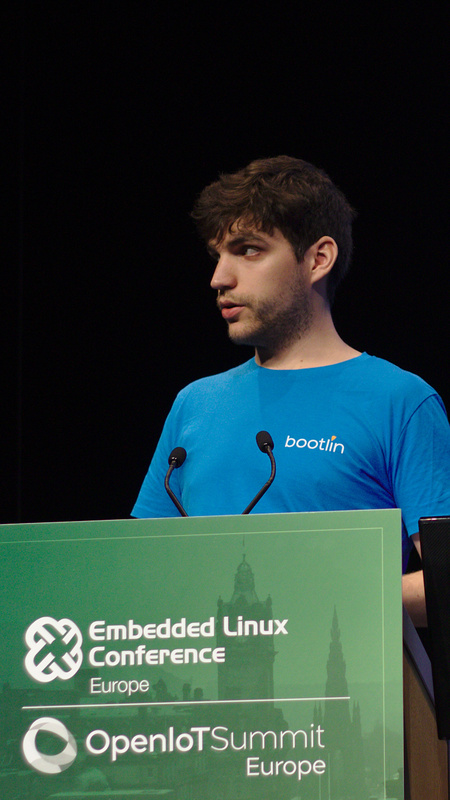 Bootlin participated to the Embedded Linux Conference Europe last week in Prague. 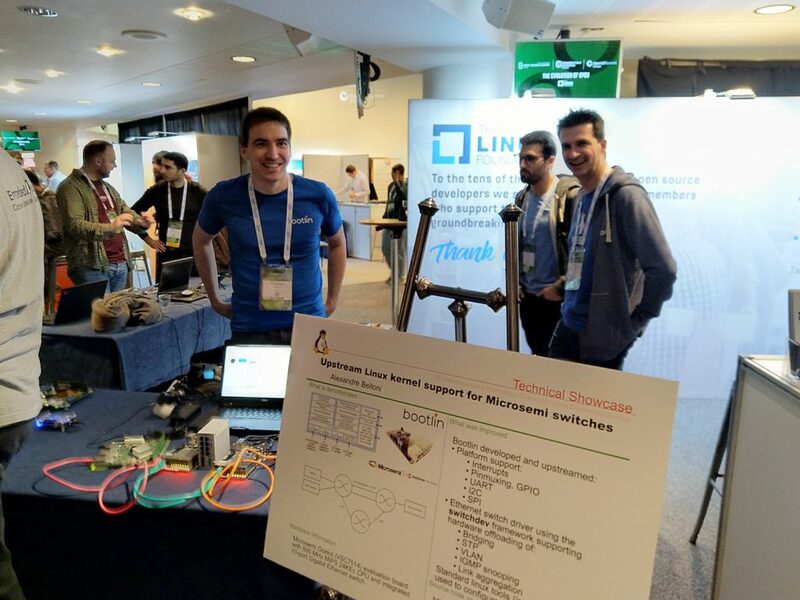 With 7 engineers attending, 4 talks, one BoF and a poster at the technical showcase, we had a strong presence to this major conference of the embedded Linux ecosystem. All of us had a great time at this event, attending interesting talks and meeting numerous open-source developers. Bootlin team at the Embedded Linux Conference Europe 2017. Top, from left to right: Maxime Ripard, Grégory Clement, Boris Brezillon, Quentin Schulz. Bottom, from left to right: Miquèl Raynal, Thomas Petazzoni, Michael Opdenacker. In this first blog post about ELCE, we want to share the slides and videos of the talks we have given during the conference. Since the introduction of the original “default”(DS) and “high speed”(HS) modes, the SD card standard has evolved by introducing new speed modes, such as SDR12, SDR25, SDR50, SDR104, etc. The same happened to the eMMC standard, with the introduction of new high speed modes named DDR52, HS200, HS400, etc. The Linux kernel has obviously evolved to support these new speed modes, both in the MMC core and through the addition of new drivers. This talk will start by introducing the SD and eMMC standards and how they work at the hardware level, with a specific focus on the new speed modes. With this hardware background in place, we will then detail how these standards are supported by Linux, see what is still missing, and what we can expect to see in the future. The Linux kernel has long provided cryptographic support for in-kernel users (like the network or storage stacks) and has been pushed to open these cryptographic capabilities to user-space along the way. But what is exactly inside this subsystem, and how can it be used by kernel users? What is the official userspace interface exposing these features and what are non-upstream alternatives? When should we use a HW engine compared to a purely software based implementation? What’s inside a crypto engine driver and what precautions should be taken when developing one? These are some of the questions we’ll answer throughout this talk, after having given a short introduction to cryptographic algorithms. Since our last “What’s new” talk at ELC 2014, three and half years have passed, and Buildroot has continued to evolve significantly. May it be because of a lack of documentation or because we don’t know where to look or where to start, it is not always easy to get started with U-Boot or Linux, and know how to port them to a new ARM platform. Based on experience porting modern versions of U-Boot and Linux on a custom Freescale/NXP i.MX6 platform, this talk will offer a step-by-step guide through the porting process. From board files to Device Trees, through Kconfig, device model, defconfigs, and tips and tricks, join this talk to discover how to get U-Boot and Linux up and running on your brand new ARM platform! This “Birds of a Feather” session will start by a quick update on available resources and recent efforts to reduce the size of the Linux kernel and the filesystem it uses. An ARM based system running the mainline kernel with about 3 MB of RAM will also be demonstrated. If you are interested in the size topic, please join this BoF and share your experience, the resources you have found and your ideas for further size reduction techniques! The next Embedded Linux Conference Europe will take place on October 23-25 in Prague, Czech Republic. Thomas Petazzoni will give a talk titled Buildroot: what’s new? Bootlin engineers Quentin Schulz, Maxime Ripard and Miquèl Raynal will also be attending the event, which means that 7 people from Bootlin will participate to ELCE! In addition to the main ELCE conference, Thomas Petazzoni will participate to the Buildroot Developers Days, a 2-day hackaton organized on Saturday and Sunday prior to ELCE, and will participate to the Device Tree workshop organized on Thursday afternoon. Once again, we’re really happy to participate to this conference, and looking forward to meeting again with a large number of Linux kernel and embedded Linux developers! Alexandre Belloni presented on ASoC: Supporting Audio on an Embedded Board, slides and video. Boris Brezillon presented on Modernizing the NAND framework, the big picture, slides and video. Boris Brezillon, together with Richard Weinberger from sigma star, presented on Running UBI/UBIFS on MLC NAND, slides and video. 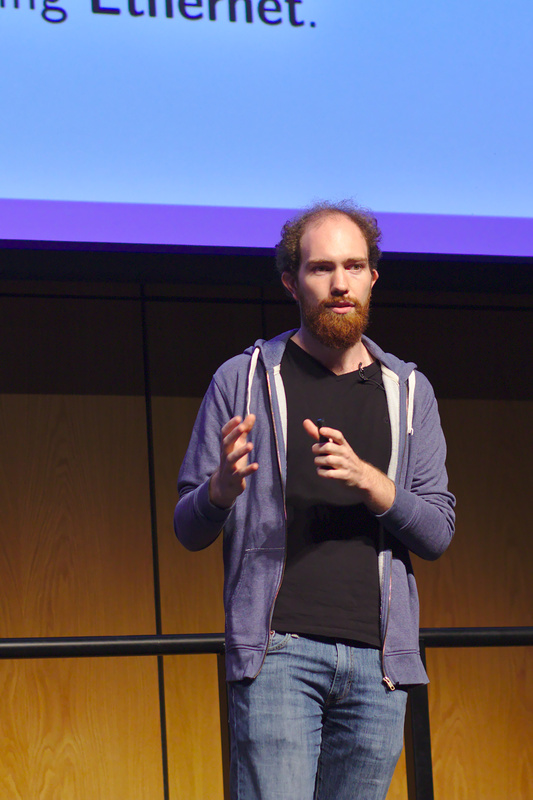 Grégory Clement presented on Your newer ARM64 SoC Linux check list, slides and video. Thomas Petazzoni presented on Anatomy of cross-compilation toolchains, slides and video. Maxime Ripard presented on Supporting the camera interface on the C.H.I.P, slides and video. Quentin Schulz and Antoine Ténart presented on Building a board farm: continuous integration and remote control, slides and video. The next Embedded Linux Conference Europe will take place from October 11 to October 13 in Berlin, Germany. As usual, the entire Bootlin engineering team will participate, which means this time 10 participants from Bootlin! Our engineers Antoine Ténart and Quentin Schulz will be giving a talk about Building a Boards Farm: Continuous Integration and Remote Control, in which they will describe the work they have done at Bootlin to build an automated test environment for ARM platforms, and how it is used for KernelCI.org contribution, and for remote development. 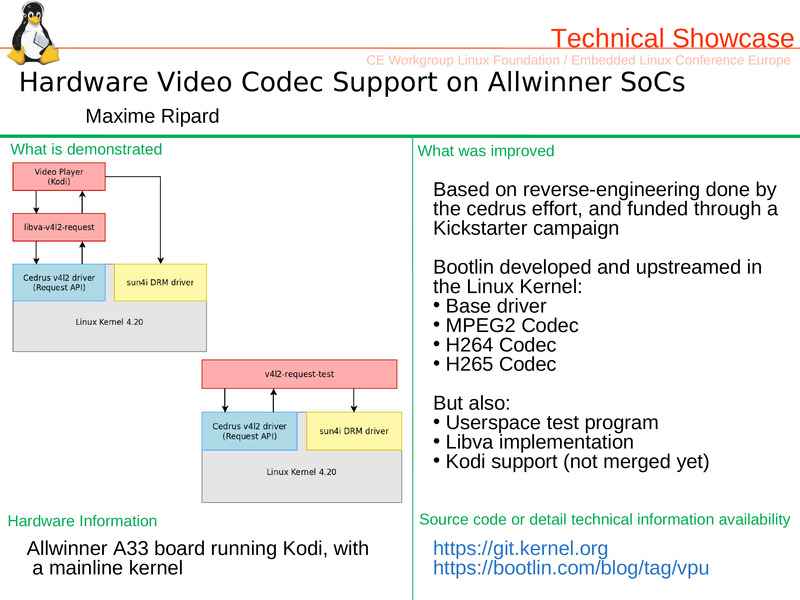 Maxime Ripard, co-maintainer of the Allwinner processor support in the Linux kernel, will discuss how he added Support for the Camera Interface on the C.H.I.P platform. This talk will walk through the v4l2 stack, the architecture of a v4l2 driver and the interaction between the SoC driver and its camera’s. 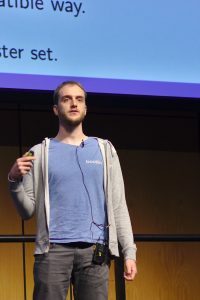 Alexandre Belloni, co-maintainer of the kernel RTC subsystem and the Atmel processor support, will present ASoC: Supporting Audio on an Embedded Board, sharing his experience getting audio to work on a number of ARM hardware platforms. Boris Brezillon, Bootlin engineer and maintainer of the Linux kernel NAND subsystem, will be co-presenting with Richard Weinberger (from sigma star gmbh, and also co-maintainer of the UBI/UBIFS subsystems in the kernel) a talk on Running UBI/UBIFS on MLC NAND. Richard and Boris will present they have been doing over the last year to make UBI/UBIFS and generally the Linux MTD/NAND stack compatible with the constraints of MLC NANDs. Thomas Petazzoni, core developer of Buildroot, will give a talk on the Anatomy of a cross-compilation toolchain. Boris Brezillon (again!) will also give a talk on Modernizing the NAND Framework: The Big Picture, in which he will describe his roadmap for the NAND subsystem, and gather input from the audience as to what needs to be improved in this subsystem. Gregory Clement, co-maintainer of Linux kernel support for some Marvell SoCs, will present a talk called ARM64 SoC Linux Support Check-List, covering everything you need to know to add support for a new ARM64 System-on-Chip. Like every year, we’re looking forward to attending this conference, and meeting all the nice folks of the Embedded Linux community!